Western CEDAR - Western Libraries Reading Series: Poetry after Auschwitz: Who was Else Dormitzer? Poetry after Auschwitz: Who was Else Dormitzer? In this talk, Dr. Sandra Alfers will present her research on the poetry of the Holocaust. She will introduce the work and life of Holocaust survivor Else Dormitzer and propose a reading of Dormitzer’s poetry collection from the Theresienstadt transit camp. Dr. Alfers is the founding director of The Ray Wolpow Institute for the Study of the Holocaust, Genocide, and Crimes Against Humanity, and Professor of German and German Section Head in the Department of Modern and Classical Languages at WWU. Dr. Alfers teaches a broad range of German language, culture, and literature courses on all levels of the curriculum. 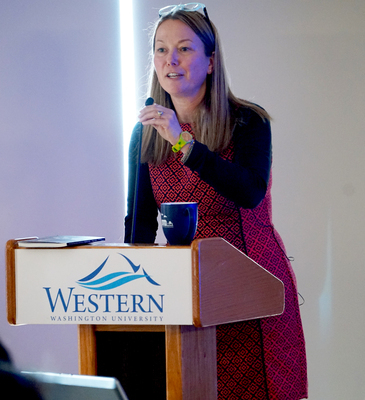 In her research, Dr. Alfers focuses on the literature of the Holocaust, particularly on German-language poetry written in Theresienstadt between 1941- 1945. Her English- and German-language publications have appeared in international journals such as Monatshefte, Oxford German Studies, and Études Arméniennes Contemporaines, and her work on Theresienstadt has been translated into Czech for Terezínské Studie A Dokumenty. 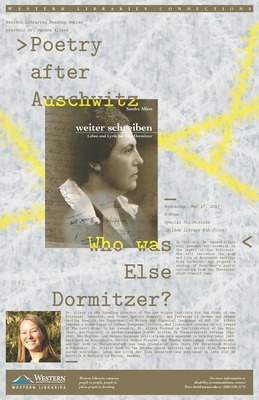 Dr. Alfers’ book on the German-Jewish activist and writer Else Dormitzer weiter schreiben. Leben und Lyrik der Else Dormitzer was published in late 2015 by Hentrich & Hentrich in Berlin, Germany.